It took one trip to the Big Island for John Peterson to see the lush tropical land that he knew would be perfect. He had a vision – to build one of the finest orchards in Hawaii. With the help of his family they planted and nurtured the trees in the hopes of growing some of the best macadamia nuts around. Ingrid Hisatake, daughter of John Peterson, had spent a lot of time on that macadamia nut orchard over the years. She had seen all the hard work that had to be done – the years waiting for the trees to bear fruit. And she had long wanted to help her father realize his dream of taking it to the next level by establishing a website and offering their macadamia nuts to folks online. 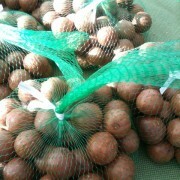 They specialize in raw in-shell macadamia nuts, slow roasted in-shell macadamia nuts. They also sell Crack-a-mac Nutcracker, made specifically to crack the macadamia nut. ©2010-2013 She grows food. All rights reserved.